EXPERTS are looking for clues as to why common black kites are falling dead from north Queensland skies. Black kites, also known as shite-hawks and firebirds, are medium-sized birds of prey and are among the few raptor species which gather in flocks. Testing has so far excluded bird flu and Newcastle disease, both highly contagious viral infections linked to mass deaths of migratory wild birds, and transmissible to humans. But the cause of the latest spate of deaths, possibly linked to a cross-border infection, is still a mystery. Biosecurity Queensland has confirmed it is testing "several kites in relation to unexplained deaths in the tropical north Queensland region''. "The exact number of bird deaths is unknown and estimates are not available at this stage of the investigation,'' a spokesman told The Courier-Mail. He said a range of tests were being undertaken for potential causes. Environment Department wildlife director Beck Williams said her office would investigate if it was suspected the birds might have been illegally killed. Bird of prey expert James Biggs said it was highly unusual for raptors to die in large numbers or, literally, drop dead from the sky. "If it is not disease, it could possibly be poisoning, but without being familiar with the ongoing tests it is hard to know,'' the Cairns Tropical Zoo bird supervisor said. 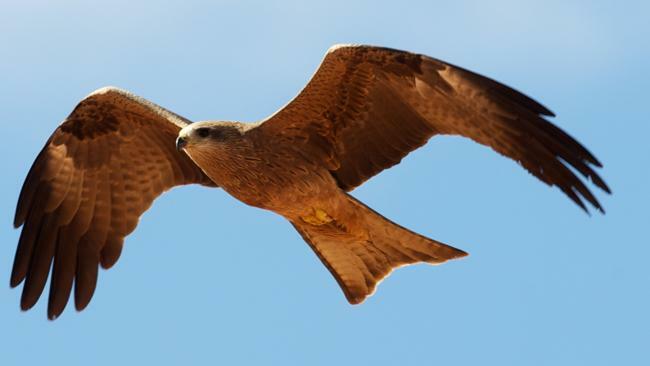 Black kites prey on insects, small animals and birds, and can spend all day soaring on the wing, hawking insects out of the air and eating them on the fly. "They are often seen hovering around fires, like cane burn-off, where they catch the insects pushed up on the updraft,'' Mr Biggs said. "But if there is a road kill they will feed on that too. Members of the public can report bird deaths by calling 1300 264 625.